It started off as an impromptu twitter exchange on the night of the Holland vs Denmark game with AVTV host Jack Woodward, but became a fun daily tweet exchange, until we covered all the various Aston Villa connections of the 16 national teams competing in Euro 2012. MOMS – It was great to see Wilfred Bouma in the Dutch squad. Any fond experiences with Freddy Bouma? JW – I interviewed him at New Hall Hotel when he first arrived. A man of few words, but a tremendous pro. I reminded him of 4-0 debut loss v West Ham. He glared at me and said, ‘ I never look back’. …and on a Danish tip? What about Martin Laursen and Thomas Sorensen? JW – I wished Martin ‘good luck’ in Danish in Odense. He just laughed. Laursen described 2008 as ‘best year of his life’ in one of our interviews. Thoroughly likeable chap! He did an entertaining birthday video for his little boy. Carries a good tune! Sorensen very good interviewee too – eloquent and intelligent. MOMS – The obvious connection here has to be Thomas Hitzlsperger. Any ‘Der Hammer’ anecdotes? JW – ‘Dear Hammer’, I kept saying his name wrong when I got him to record an ad on Villan radio! Thomas is a lovely fella. He broke female fans’ hearts when he revealed he was spoken for on air. [He] had a strange German/brummie/cockney/Aussie twang to his accent, but spoke better English than most English players though. I suggested to Kevin McDonald it was fate ‘der Hammer’ Hitzlsperger would play for West Ham. Kev smiled and said, my jokes weren’t getting any better. MOMS – Were you working at Villa in the days of Fernando Nelson? MOMS – Did you have that one pre-prepared for the game? JW – Ha ha, can’t reveal my secrets. Suffice to say the best ad libs are prepared! MOMS –Did you ever see the ghost of Bosko Balaban at Villa Park? Did he exist?! JW: Didn’t see Bosko much. Then again nor did the fans. MOMS – Have you been on the craic with Given and Dunne? JV: Mistook Dunnee’s son for a girl as he frolicked on the Villa Park pitch. Long blonde hair, but poor call! Can’t stress enough how Given, Dunne & Keane deserve success here, careers have been leading to this. MOMS – King Carlos was a big fan’s favourite. Sad to see him go? Did you ever get invited to his coffee club? JW: Carlos was a very good ambassador. I often tried out my A Level Spanish on him. Muy bueno! MOMS: So no coffee for you? Benito Carbone, before your time? How excited was you after the Peace Cup win vs Juventus? JW: My best Carbone line – ‘Beni means good. Beni means goals’. Carbone’s cupboard (stored his things there) in Holte End became Woodward’s wardrobe when I moved! MOMS: haha. You took his clothes? 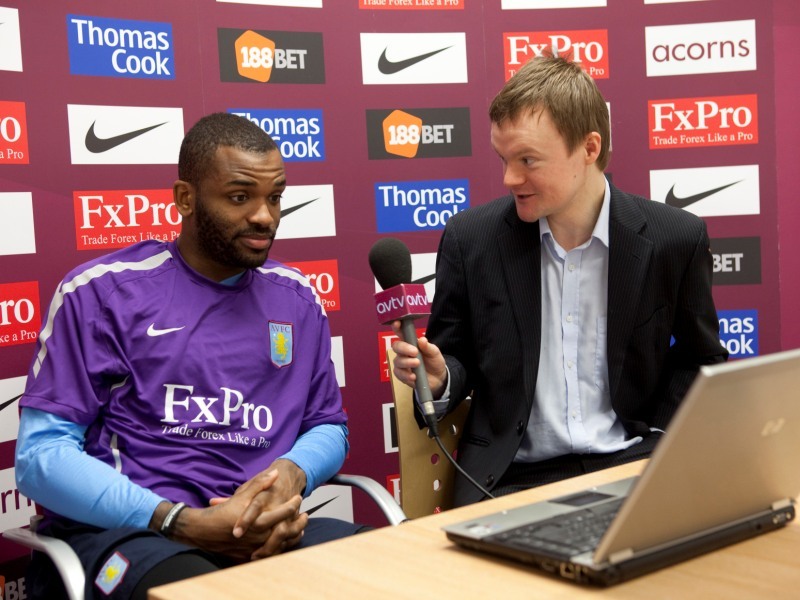 MOMS: Of the ex-Villa players in the England team, if they won the Euros, which one would you interview if you were offered one interview – and why? JW: All professional and happy to talk, they saw it as part of their job. [Probably] Milner, very down to earth, proper Yorkshireman! MOMS: Didier Six, Mathieu Berson, Pires, Houllier, the French don’t seem to stick around at Villa. Pourquoi? JW: Houllier was quite the ‘philosophe’. ‘Attitude and aptitude’ was my favourite from him. French speaker Djemba Djemba said, I was following him when I bumped into him on the stairs of the hotel in Odense. Zut Alors! MOMS: I suppose Didier Six was before your time? MOMS: Did you have a favourite personal experience with Mr Melberg? And did you also come across Marcus Allback? JW: Olof said ‘to be invisible’ when I asked him his preferred super power. Hope the Swedish defence is invisible tonight [against England 3-2]. I really liked Marcus as well. His crucial double sank Chelsea under Graham Taylor. Patience was a virtue, shame things didn’t work out. MOMS: Jazz freestyle tangents accepted, any Villa moments you can connect to the co-hosts? MOMS: Did you make the trip to Moscow for the CSKA game? JW – Ha ha, not sure, but he has widest grin in football since Dwight Yorke! MOMS: Memories of Villa’s Czech mates Baros and Berger? JW: Baros often sported a dubious beige man bag, and a look of disdain, if he thought an interview request was on its way. And Berger too frequently on the treatment table for much banter, but vital Easter strike at Blackburn and goal of season versus the Blades! MOMS: Of course, Villa once had Dariusz Kubicki under Big Ron, but what a lot of Villa fans won’t know is Eric Lichaj holds a Polish passport…how’s his Polish? JW – Will dig out a Polish phrase book and test him next season! MOMS: What’s your strongest language, Jack? JW: Spanish. My slightly dubious Jamaican/Welsh accent scuppered hopes of living there though, so I concentrated on history at uni!